Bell Museum’s Exploradome – the original GeoDome Theater – upgrades after 11 years in the field! 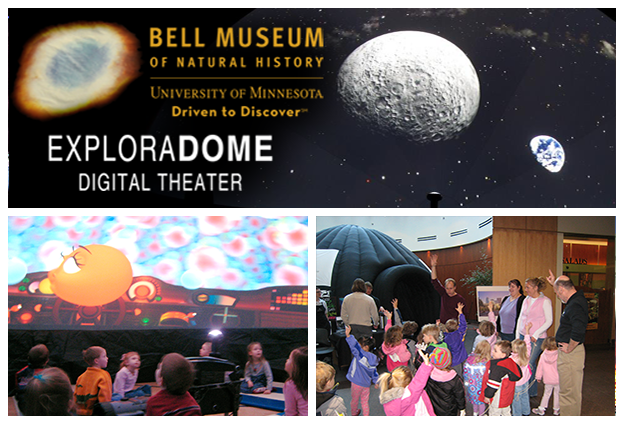 Home / Announcements / Bell Museum’s Exploradome – the original GeoDome Theater – upgrades after 11 years in the field! Since 2006, The Bell Museum of Natural History’s Exploradome has traveled to schools and community sites to bring to them the wonders of the universe. It was the first GeoDome Theater we deployed as a turnkey system. Ahead of the opening of the new Bell Museum + Planetarium in 2018, the team at the Bell is launching a new ExploraDome for the 2017-2018 school year, and they’ve upgraded to a new GeoDome Theater system. The ExploraDome, then run by the Minnesota Planetarium Society, was the founding partner of the Minnesota Regional Planetarium Network. Planetariums are located in K12 school districts, universities, and museums across Minnesota, Wisconsin, North & South Dakota. The regional planetarium network shares costs, resources and programming opportunities, with a collaborative focus on teaching and learning in both fixed and portable domes. We’re excited to support the Exploradome over the next 11 years!